I hope it’s not a faux-pas to blog about too many takes on roasted veggies. Is anyone keeping track, though? 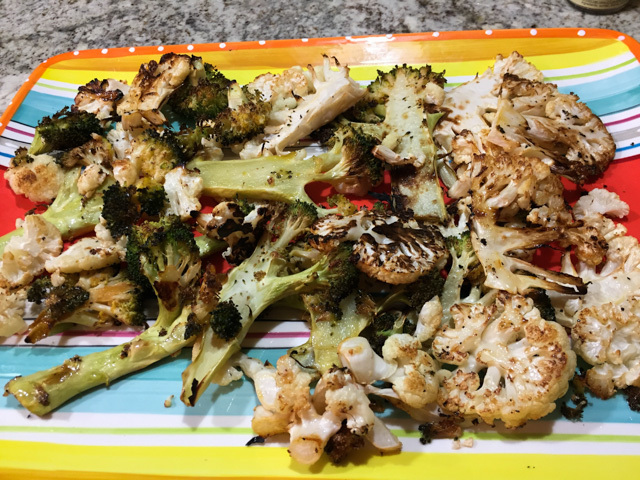 But I cannot help it, not only the weather is perfect for turning the oven on, but roasted veggies go well with pretty much any main dish, from beef to seafood, and if you like to go vegetarian, they can be the star of the show. I saw this recipe featured in a PBS cooking show that is new to me, Pati’s Mexican Table. Like Marcela Valladolid, Pati cooks Mexican food, but with a more down to earth demeanor. She has an adorable accent, and that friendly aura that captivates the viewer right away. Anyway, this is such a simple recipe, you can memorize it in a second (quiz to follow) : equal parts of orange juice, lime juice, and olive oil. Salt and pepper. You are done. Then, there’s the Cotija dressing, but no quiz on that one, because I am a kind teacher, and want you to get an A+. Mix the lime juice, orange juice, olive oil, salt and freshly ground black pepper in a small bowl. Whisk very well to combine. Brush 2 large baking sheets with olive oil. 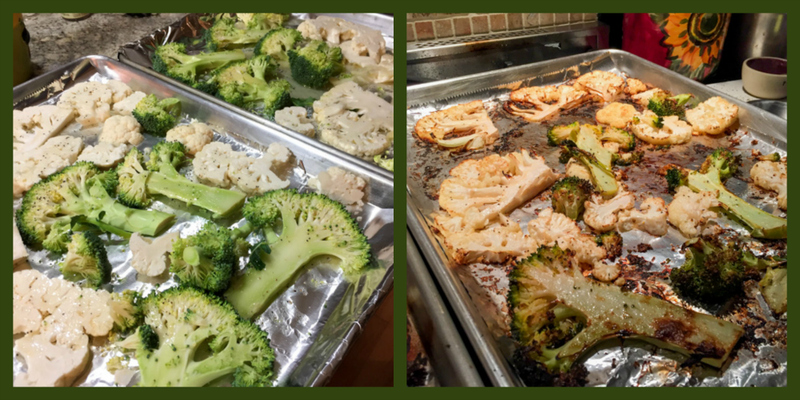 Place the broccoli and cauliflower on each baking sheet, making sure that it is well spread out and not crowded. Evenly pour the orange juice mixture all over the vegetables. Place in the oven and bake for 25 to 30 minutes, flipping once in between, until well roasted and considerably charred. Remove from the oven. While the veggies are roasting, combine in the jar of a blender the queso cotija, Mexican crema, vegetable oil, sherry vinegar, water, salt and pepper. Blend until smooth, adjust with water if desired. 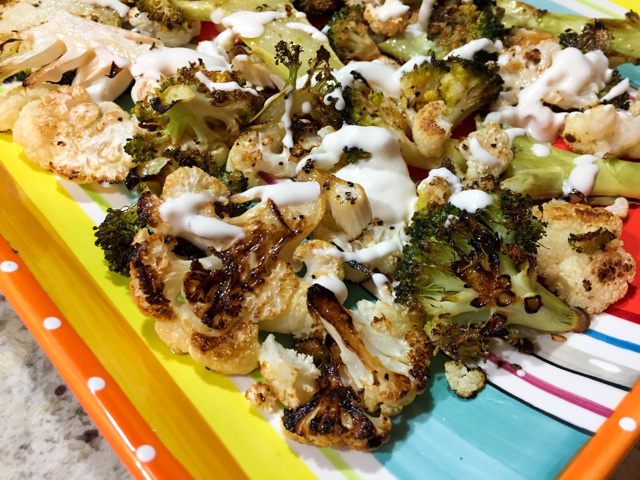 Serve the broccoli and cauliflower and ladle the queso cotija right on top, or pass the sauce at the table so that everyone can add as much as they want. Comments: What made me want to try this recipe was the unusual way to slice the veggies. Vertically, including the stems. Essentially no waste, and they look so cute laying flat on the baking sheet. That also gives a nice amount of char all over, which means a ton of flavor. The citric component gets intensified by reduction, the veggies tender but still retaining some bite. The Cotija dressing is super flavorful. The recipe makes more than needed for a light drizzle all over the veggies. Leftover keeps quite well in the fridge and next day you can drizzle over avocados, tomatoes, or even some grilled meat. 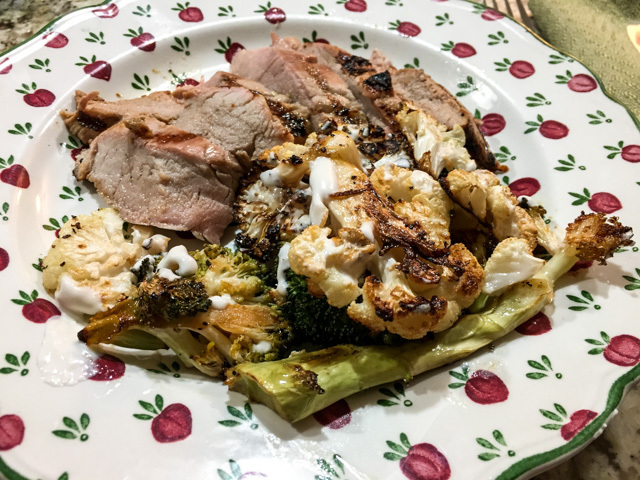 Speaking of grilled meat, we paired these saucy grilled veggies with grilled pork tenderloin, for a delicious, quick and easy dinner. and now for the quiz. What do we add to the veggies before roasting them at 475 F? Note to self: adapt this recipe for the steam-roasting technique from Fine Cooking. Maybe using just the florets will work better in that case. Worth playing with, that’s for sure. recipe from The London Cookbook). Combine the salt, cumin, caraway, coriander, and paprika. Sprinkle half of the spice mixture over the ribs. Cover loosely with plastic wrap and refrigerate overnight. The next day, pat the ribs dry with paper towels. Heat the oil in a large sauté pan. Add the ribs and cook for 2 to 3 minutes on each side, until golden brown. If your pan is on the small side, work in batches so as not to overcrowd the pan. Transfer the ribs to a plate, leaving the oil behind. Add the onions to the pan and sauté over a medium-low heat until they are soft and nearly translucent. Stir in the garlic followed by the chard and the remaining spice mixture. Stir and cook for 5 minutes longer. Add the short ribs and chickpeas, pour in the stock, and bring to a boil. Skim any foam that floats to the surface and then lower the heat, partially cover, and simmer for 2 to 3 hours, basting occasionally. The ribs are done when the sauce has thickened and the meat pulls away from the bone. Season with salt and pepper and the juice of 1 lemon. If you have labneh, use it. Otherwise, vigorously whip the yogurt and olive oil together with a fork. Season to taste. Serve the stew with a dollop of labneh and a wedge of lemon. 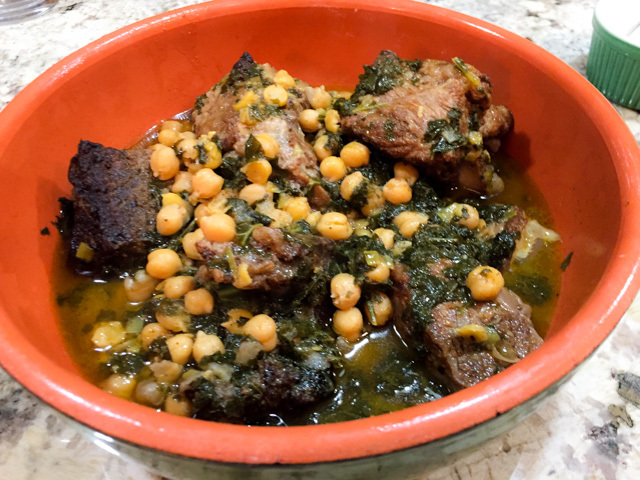 Comments: Short ribs are the definition of comfort food, but when chickpeas and chard are added as supporting actors, you have a show-stopping dish that spells comfort in capital letters. I knew it would be hard to get a good picture, because well, that is the problem with brown food, but allow yourself to go past the photo and trust me, the taste is sublime. Plus, Aleksandra’s choice of labneh to spoon on top fulfills the circle of my fascination, joining Middle East and England in one amazing dish. There’s something about labneh, you must try it if you are a labneh virgin. 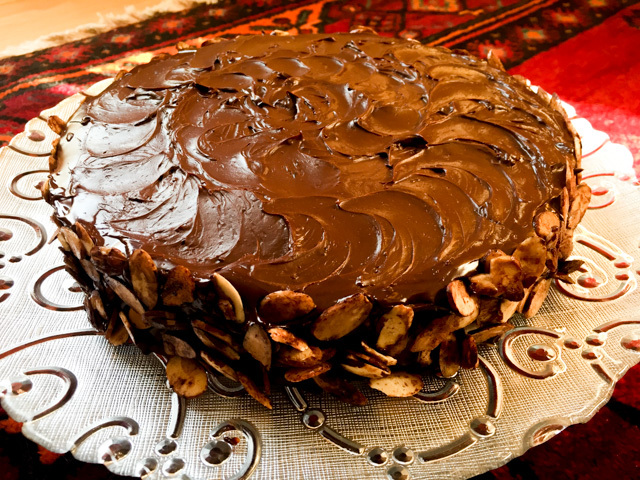 Easy to make if you cannot find it at your grocery store, just follow Sawsan’s recipe and be ready to be amazed. First, let me say that she is a delightful writer. She doesn’t simply offer you a recipe, she will show you why that particular restaurant made the cut to be showcased in her book. The quality of the food matters, but it’s clear that behind great food and service you’ll find genuine, hard-working people with the passion to share their cooking with family, friends, and customers. You will read fascinating stories about places that have been in business for a long time… She offers the perfect amount of prose before each recipe, with a nice balance of wit and knowledge. 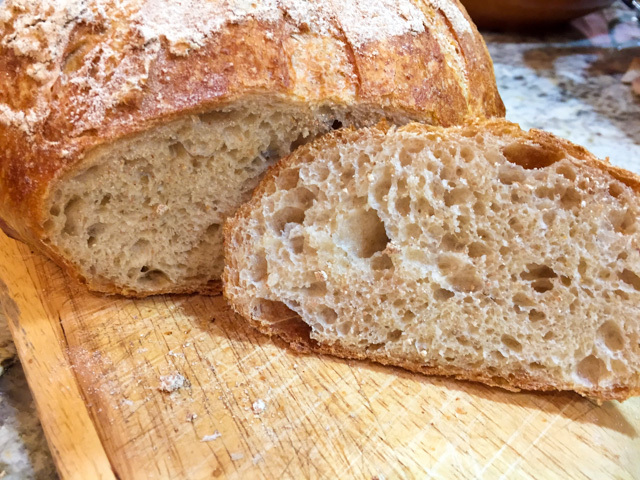 The recipes are for the most part quite straightforward to make at home, Aleksandra often suggests adaptations for ingredients that might be hard to find. As you know, I have no partnership with amazon.com or any other company, and only review cookbooks I fall in love with. This was definitely one of them. The book is divided in 10 chapters. Chapter #1 – Light Fare. The first recipe of the chapter is a perfect example of what the book is all about. A wonderful praise of Ruth Rogers, from The River Cafe, the way she runs her restaurant with “no shouting, no swearing, no fear.” The recipe, a Crab and Raw Artichoke Salad. Have you ever considered shaving artichokes to enjoy in its raw form? I had not. Intriguing… Other favorites from the chapter: Potted Shrimp, from Rules, a place dear to my heart, since Phil and I enjoyed two very romantic dinners at Rules years ago; Shrimp Aguachili Seviche with Jalapeno and Citrus; Grilled Leeks, Chevre, Brown Butter & Smoked Almonds. Smoked almonds, now that’s something to dream about. 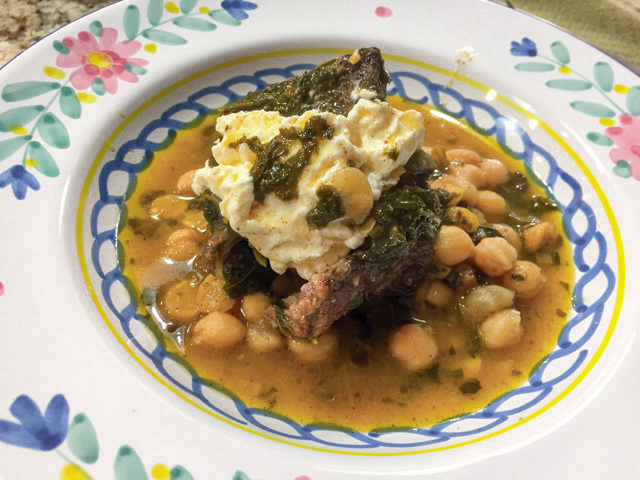 In this chapter you will get to know interesting facts about Ottolenghi, in the introduction to one of his recipes – Mung and Haricots Verts. As Aleksandra puts it, the recipe is “very Ottolenghi.” The mung beans are Asian, the haricots verts French, the spices Indian. The recipe for the classic Welsh Rarebit comes with a delightful description of two gentlemen enjoying it at St. John. All very proper, as you must expect for all things London. 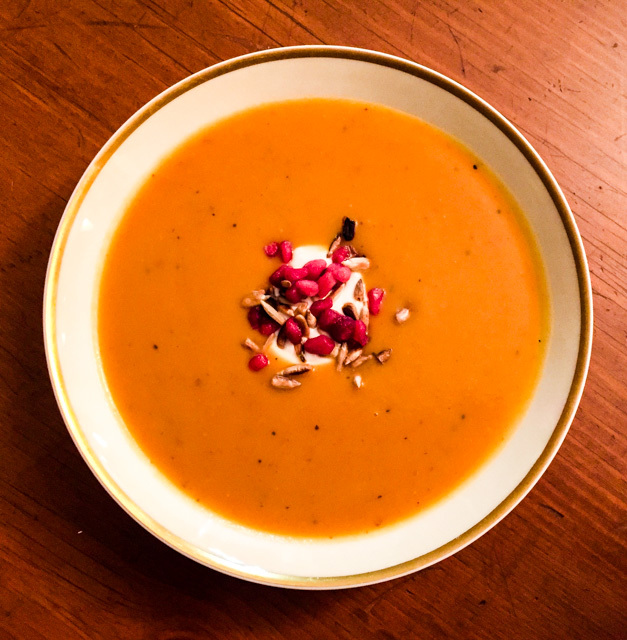 Chapter #2 – Soups. My heart missed a beat with the description of the Fennel and Watercress Soup from Newman Street Tavern. Fennel is like green candy for Aleksandra, and I was left nodding in full approval. She mentions walking in blizzard-like conditions in New York to get some fennel juice at City Bakery, and that made me want to go to London with a stop at JFK with enough hours to allow for a quick Uber drive to that spot. If you live in New York, go sip a glass and tell me all about it. She follows with Smoked Paprika, Piquillo Pepper, and Tomato Soup with Chevre Toasts. Yes. To. All. How about Roasted Corn and Chorizo Chowder? 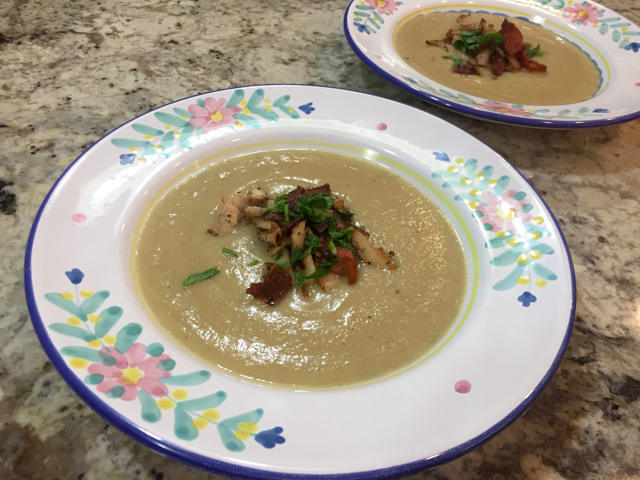 But the recipe that had me mesmerized for good was Celeriac and Chanterelle Soup. I made it. I absolutely loved it. Here it is, as a teaser for you. Simply spectacular. Chapter #3 – Pasta, Rice, and Grains. This whole chapter is a must-cook. Just to give you a couple of examples, consider the Cinnamon-Scented Porcini Duck Ragu, from Mission. If I had easy access to duck meat, I would definitely make it. Another dish that almost made it to my choice to feature the book: Pork Shoulder, Black Pepper, and Mascarpone Ragu. Totally understandable, right? But maybe the very best is a Chestnut Straccetti with Mushrooms and Chestnuts. You make the pasta from scratch using chestnut flour. OMG. Her description says it all: This dish is, quite simply, a knockout. The photo, folks, the photo is almost too much to stand. You need to host a dinner party for your very best friends and bring that to the table. This session opens with Spiced Heritage Carrots, Freekeh, and Labneh, which prompted her profession of love for cardamon, which I totally share. In fact, I also open the jar and take a good sniff just for the pleasure of it. It makes me feel like riding on a magic carpet to far away lands. This recipe has my name written all over it and I know I’ll be making it soon. It follows with Roasted Squash, Braised Lentils, Soft-Boiled Egg, Garlic Yogurt, and Dukka. A symphony. Potato Chaat with Pomegranate, Mint, and Rose Raita also quite enticing to me, and apparently to everyone who dines at Gymkhana: almost everyone who walks through the door of Gymkhana orders this potato chaat before even being shown to a table. Talk about endorsement! Chapter #5 – Seafood. Scallops with Corn Puree and Chile Oil is maybe my favorite choice in this nice chapter. Of course, she includes the classic Fish and Chips, her version coming from Tom’s Kitchen. In her words: They are indisputable. A fact of British life. “Since the days of Charles Dickens and his chips with reluctant drops of oil“. How cool is that? But there’s also Sugar-Brined Salmon with Radish, Cucumber, and Pea Shoot Salad, Ginger and Cilantro Spiced Cod with Cauliflower Couscous (love this one! ), or my favorite fish in the world, Sea Bass with Hot Paprika Vinaigrette, from Moro a must-visit restaurant. Chapter #6 – Fowl. I would gladly cook (or eat) every single one of the recipes in this chapter. Period. It starts with Chicken Scaloppine with Mushrooms and Marsala, you simply cannot go wrong with that. But how about Indian Chicken and Pumpkin Curry? In fact, the chef behind that recipe, Mark Hix, from Tramshed, was one of the first to offer recipes, encouragement and introductions to Aleksandra when she started her research for this book. Chicken Berry Britannia is a very interesting recipe too, the name pays tribute to a very famous place, Bombay’s Britannia. Americans will flip for Buttermilk Fried Chicken in Pine Salt. Yes, pine salt. Or some Honey-Glazed Duck Breast with Roasted Plums and Bok Choy. Chapter #7 – Meat. The recipe I shared with you comes from this chapter, obviously. The chapter is full of unusual recipes, counting three different takes for the fashionable pork belly: Kakuni (Japanese Braised Pork Belly), Ottolenghi’s Pork Belly with Apple and Yuzu Puree with Black Bean Sauce, and finally Treacle-Cured Pork Belly. You will also find the super classic Beef Strogonoff, a version coming from The Delaunay. Her words: strogonoff has lost its reputation, having appeared too often and never well, on one too many cafeteria lines and airplane trays. So true! This recipe will do away with unpleasant memories… I should try it, as Beef Strogonoff is a favorite of ours. I would make every single one of the recipes. There, I said it. And I don’t even like sweets that much. Starting with Chocolate Nemesis, described as “this is the real thing.” But how about Ras El Hanout and Buttermilk Loaf? Irresistibly intriguing. Muscovado Custard. OMG. My favorite perhaps would be Orange, Mint, and Rose Petal Cake. I almost chose it as featured recipe. Bakewell Tart from Rules also called my name. By the way, did you know that Rules Restaurant opened the same year that Napoleon began his campaign in Egypt? Yeap, 1798, making it the oldest restaurant in London. And was a favorite spot for Clark Gable, Charles Chaplin, amongst others. A total of 22 mouth-watering recipes to choose from in this chapter. Chapter #9 – Chilled Desserts. Baked Alaska is in there, but the recipe that has me absolutely mesmerized is Black Sesame Panna Cotta. I even bought black sesame paste and intend to try it soon. Her description (and the photo) is enough to make me drool in anticipation. Of course, Orange Blossom and Milk Pudding, Burnt Orange Chocolate Sorbet (swoon! ), and Marsala Raisin Ice Cream would be more than welcome to wrap up a dinner party. Chapter #10 – Cocktails. I confess that the “idea of a cocktail” appeals more to me than actually having one. But if you enjoy them this chapter will be quite amazing. From River Cafe you’ll find White Peach Summer Martini, and Blood Orange Winter Martini. There’s also a Mumbai Martini from Benares, one of the most sophisticated restaurants in London. This particular drink has notes of curry and ginger. Maybe I should turn it into a tea? (just kidding). But, speaking of tea the Cinnamon Bellini would be perfect for tea lovers, as it mixes Assam tea leaves with cinnamon schnapps (Godschlager). Ottolenghi shines in this chapter too, with a Sage and Cardamon Gin with Pineapple and Cloves. All quite enticing! I hope you enjoyed my little virtual tour of The London Cookbook. Consider making a little place for it on your bookshelf, even if it is a bit crowded, like ours. Or, go Kindle for a guilty-free experience, which is exactly what yours truly did. 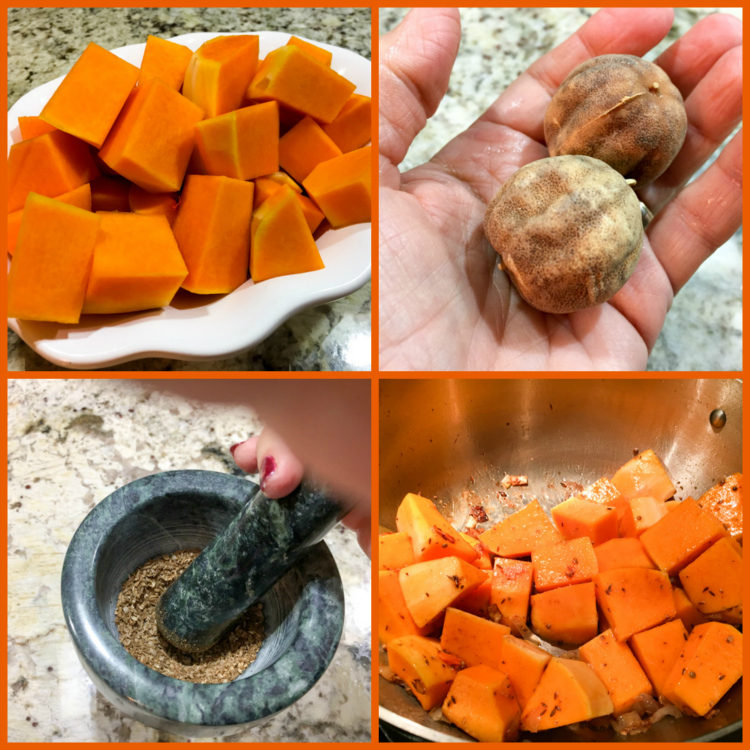 Aleksandra, thank you once more for allowing me to publish one recipe from your wonderful book! I simply must go back and go straight to Ottolenghi to grab a nice portion of tahini cookies. Then, keep calm and carry on! Here I am to share with you not one, not two, but four recipes that are so simple you could make them in your sleep. Each delivers a lot more than you’d expect in flavor and you will find yourself making them again and again. Not necessarily in your sleep. 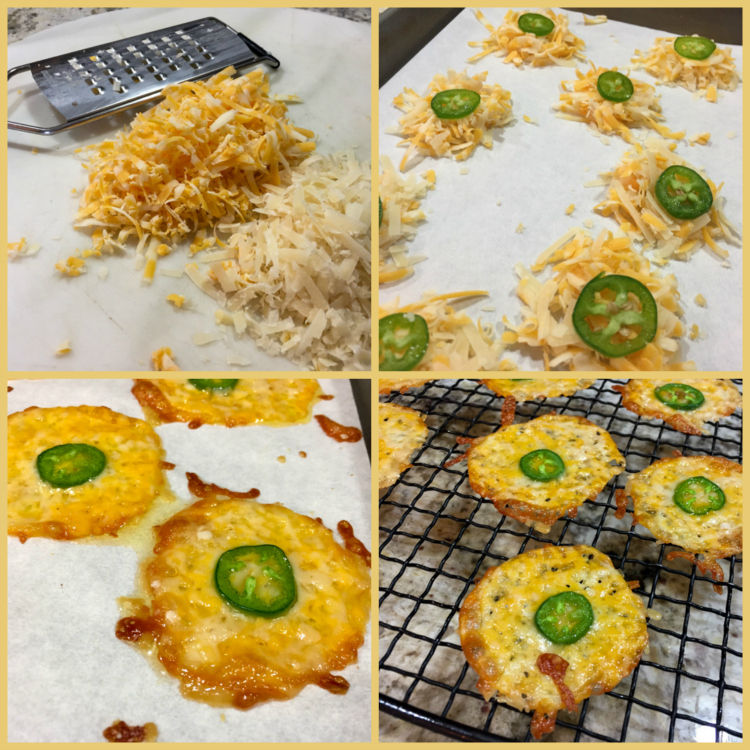 CHEESE JALAPENO CRACKERS. Credit should go to Angela, from Divalicious Recipes. Recently she composed a post with 50 ideas for low-carb appetizers very well-timed for a Super Bowl party. These crackers are pure cheese, with a kick of Jalapeno. I made only eight for the two of us. There was a bit of an argument over the last one, we could not quite agree on who had the right to grab it. I won. Determination is everything. My version, 50:50 Monterey-Cheddar & Parmigiano. Baked at 350F for about 10 minutes. Watched them like a hawk. 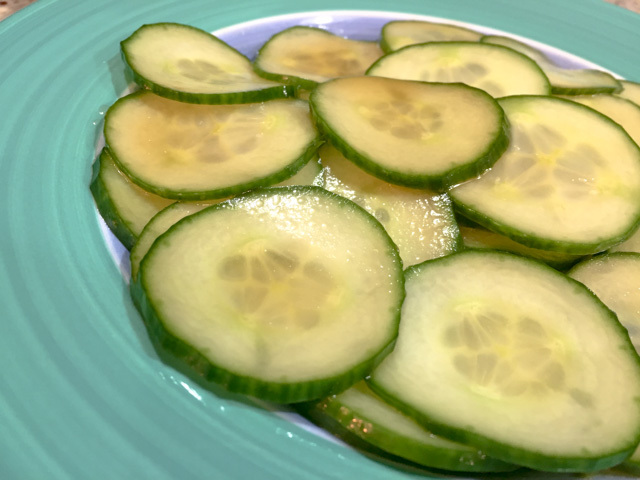 MARINATED CUCUMBER SALAD. I saw this recipe at FoodTV the other day, a show I don’t normally watch called Valerie’s Home Cooking. I admit to having a bit of a problem with Hollywood folks turned into FoodTV chefs. Maybe I should open my mind a little? Nah, I like my mind the way it is… Anyway, her recipe sounded great but I adapted on my second time around because she used too heavy a hand on the sesame oil. It pretty much overpowered the delicate cucumber. 1 teaspoon dark sesame oil. Slice one cucumber as thin as you can make it, a mandoline could be helpful. I used a Persian cucumber, so I did not remove the seeds, but if you only find regular ones, removing the seeds is a nice touch. Delicately mix the cucumber slices with the dressing, refrigerate for half an hour if you have the time, but it’s good right away too. 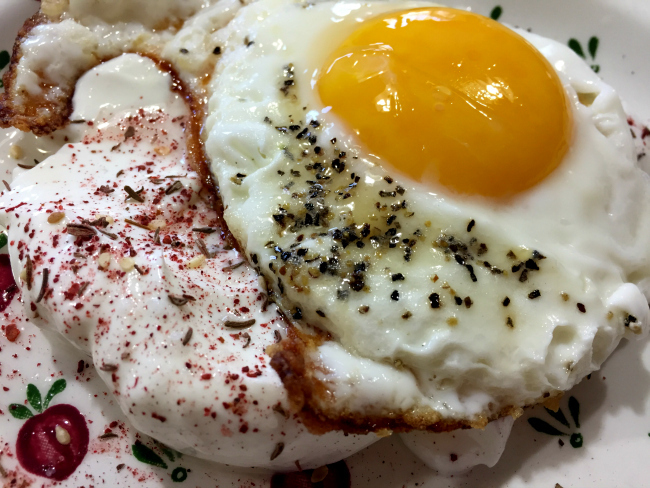 FRIED EGG OVER LABNEH WITH ZA’TAR. This is unbelievably good! I confess I’m addicted and have it several times each week for my lunch. I know you will find the combination a bit odd, but trust me, it is to die for. Just smear some labneh or thick Greek yogurt on a plate. Squirt a bit of lemon juice and a little salt (no need for salt if using labneh). Sprinkle za’tar all over, use a heavy hand if you are a za’tar lover. Fry an egg whichever way you prefer, for this concoction I like a little bit of a crisp edge. Rest the egg on top of the cold labneh or yogurt mixture. Swoon! I use different spices sometimes. Sumac goes well, Ras El Hanout is superb, but za’tar is hard to beat. There’s something about the mixture of the runny egg yolk with the cold seasoned yogurt, I never tire of it. I first saw this combination at Maureen’s beautiful blog, she also included in her cookbook Rose Water and Orange Blossoms, which I own. 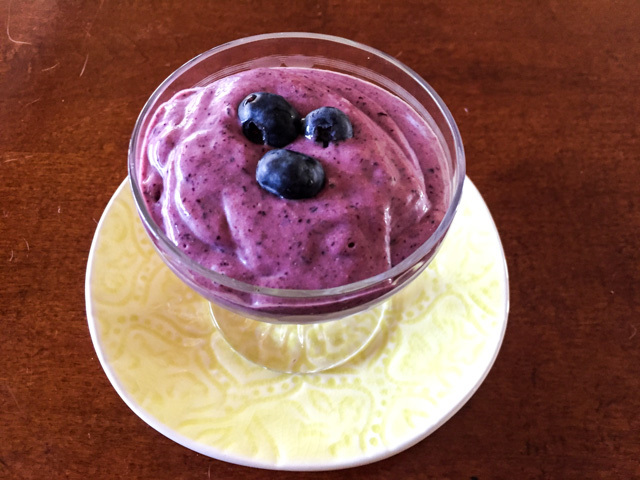 BLUEBERRY CHIA PUDDING. I am usually pretty slow to jump on fashionable ingredients, and most of my adventures with chia seeds have been unremarkable. Not this one. It turned out so good I would serve it for company without thinking twice. It is creamy, sweet and tangy at the same time, the coconut flavor so subtle it would not offend those who are not too fond of it. All you need to do is remember to soak the chia seeds the day before, or at least a couple of hours in advance. A minute in the blender, and there you have, Nirvana in a bowl. You can find the recipe here, but I highly recommend you get the book My New Roots, where you’ll find this one and a multitude of other interesting recipes. Back to macarons. A few months ago our friend Gary – Patissier Extraordinaire – brought to my attention a book by Pierre Hermé, called quite simply Macarons. 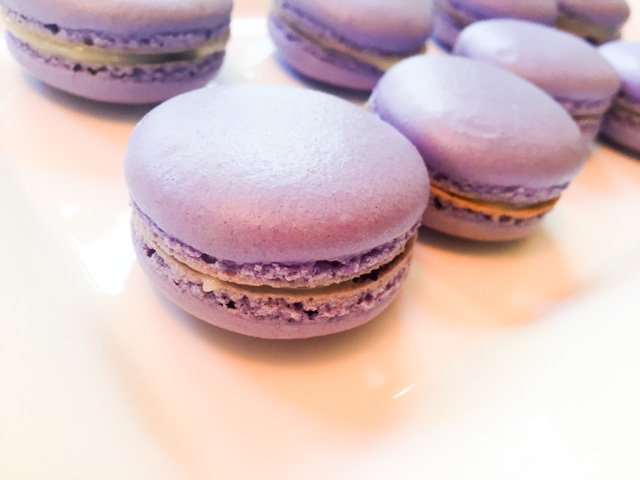 Once I got it, I quickly realized that much like his classic masterpiece Desserts, Macarons is not for the faint of heart. My first adventure with it was almost a complete disaster, save for a few pistachio macarons that would barely qualify as such. In the book he says to use a convection oven at 350F, and I guess that was too high, or my oven misbehaved. Hard to tell. All I know is that my beautiful bright green macarons turned brown in 2.5 seconds right in front of my eyes, as I happened to be staring through the oven door when the metamorphosis took place. You know, the one that took perfect macarons to ruined ones. Of course, they did not turn homogeneously brown, but all blotchy, really unappetizing. Yes, there was considerable amount of profanity that afternoon, in three languages, although French was first. After that dreadful weekend, serendipity hit big time. I got an email from Craftsy.com with a special offer for their online classes. One of them was Miniature French Desserts, which included – you guessed it – macarons! I read the reviews and everyone raved about it. I signed up, downloaded the class and here I am to share with you my first real nice experience with these finicky creatures! Plus, Colette Christian, the wonderful instructor, gave me permission to share the recipe with my readers. How cool is that? Line 2 or 3 heavy baking sheets with parchment paper or Silpat mats. 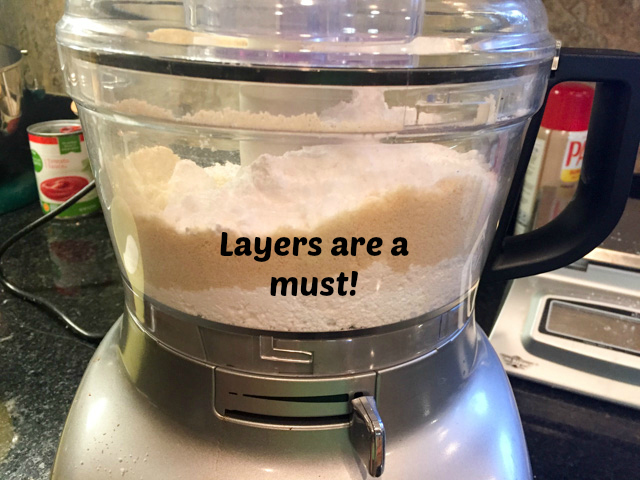 Layer the powdered sugar, almond meal and lavender in a food processor or mini processor. Pulse until the mixture looks like fine meal, about 15 seconds. Pass through a sieve and transfer to a small bowl. Set aside. Slowly rain in the granulated sugar, trying to aim the stream between the whisk and the side of the bowl. Turn the speed up to medium-high. Continue to whip the meringue until it is soft and shiny. It should look like marshmallow creme. Add the gel color and the vanilla. Staying at medium-high speed, whip the egg whites until the mixture begins to dull and the lines of the whisk are visible on the surface of the meringue. Check the peak. It should be firm. When you hold the beater up, the meringue should gently fall with and angle supporting the peak at the with the angle supporting the peak at 11:30hs (easier to understand on the tutorial video). Transfer the whites to a medium bowl. Slam each sheet hard four to six times on the counter. Then fist bump each end of the sheet’s underside twice. Let the unbaked macarons dry until they look dull but not overly dry. Drying time depends on humidity. Ina dry climate, the macarons can dry in 15 to 20 minutes; in a humid climate, it can take 35 to 40 minutes. While the macarons are drying, heat the oven to 330 F (170 C/gas mark 3). Bake one sheet at a time on the middle rack. Check in 11 minutes. 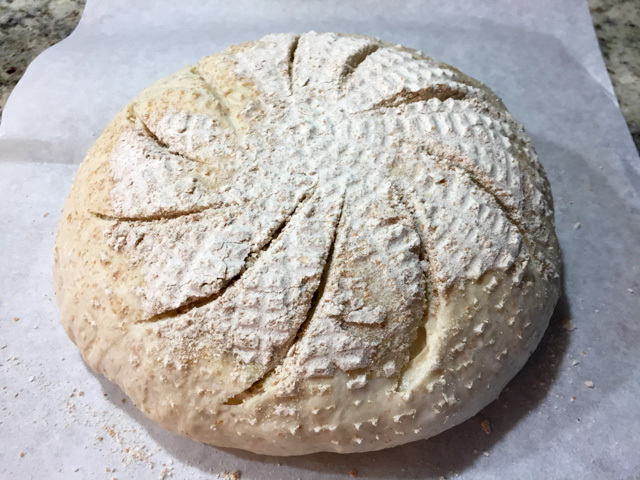 If the tops slide, then bake for 2 to 3 more minutes. The macarons should release without sticking. Check one or two. If they stick, put them back in the oven for 1 to 2 more minutes. Let the macaroons cool for 10 minutes before removing from the pan. Make the filling: Place the white chocolate in a heatproof bowl. Bring the cream to a rolling boil in a small saucepan. Pour the hot cream over the chocolate, and let stand for 15 seconds. Stir with a spatula until smooth. If the chocolate has not fully melted, place the bowl in a saucepan of steaming water (the heat should be off), and let stand for 1 or 2 minutes. Stir again until the chocolate is fully melted. Add the lavender extract. Assemble the macarons: find two macarons similar in size and add a good amount of ganache to the bottom of one of them. Place the other on top and squeeze gently to take the filling all the way to the edge. Ideally, store in the fridge for 24 hours before devouring them… or sharing with great friends! Comments: I cannot tell you how much I loved this online class! Colette is personable, fun and a natural teacher. The video perfectly timed so that you can actually make them in real-time together with her, pausing the video during baking, obviously. You can pause it, rewind it, save and watch it again and again. You’ll also get printed material with full recipes and variations. Now, Colette is one super neat chef, because her kitchen ends up in the exact pristine condition as it was in the beginning. The same applies to her apron. I need to evolve into another type of human being to match her serenity and grace. Her method is pretty straightforward. For starters, she skips the sifting – and has a rationale for doing so. And she also prefers the simpler French meringue, again for reasons she states during class. I have to say that visualizing the macaron batter, and following her very careful explanation made all the difference. 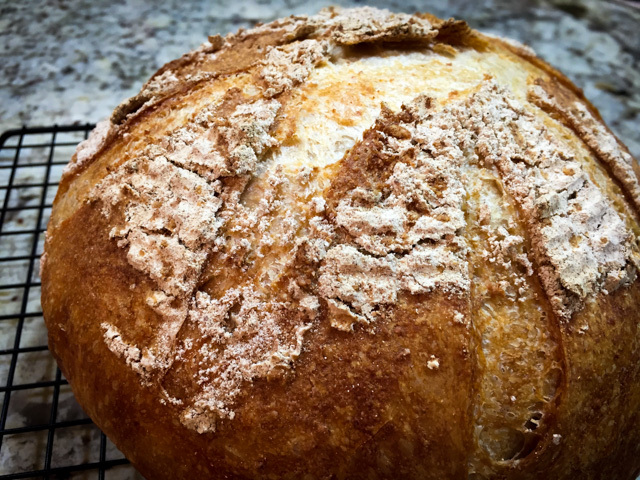 I concluded that in all my previous attempts I failed to mix the batter enough – that’s why many of my shells would crack and end up with a coarse texture, some hard chunks inside. 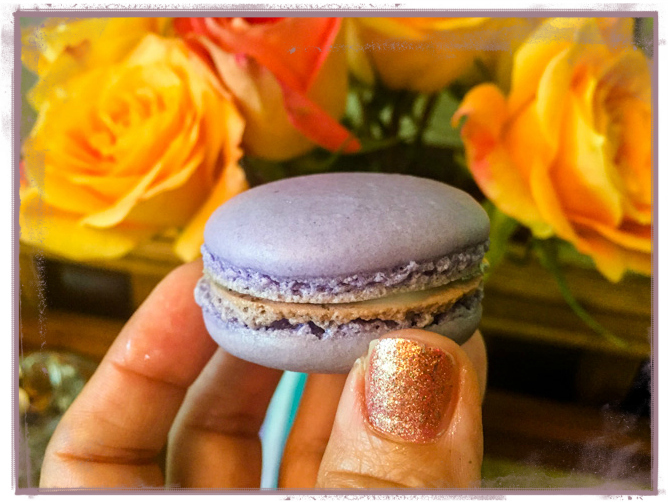 If you have a deep desire to conquer macarons, her online video is a great option. I haven’t watched the other classes in the same video (Madeleines, Lemon Meringue Tartlets, and Opera Cake), but intend to do so in the near future. Madeleines have been on my list of goodies to make for… ever. Or so it seems. Colette also gives many tips to create your own flavors, it is amazing how versatile this cookie can be. As long as you respect simple rules to avoid messing up the basic formula, you’ll be fine. I would also like to invite you to take a tour of the blog Pizza Rossa. 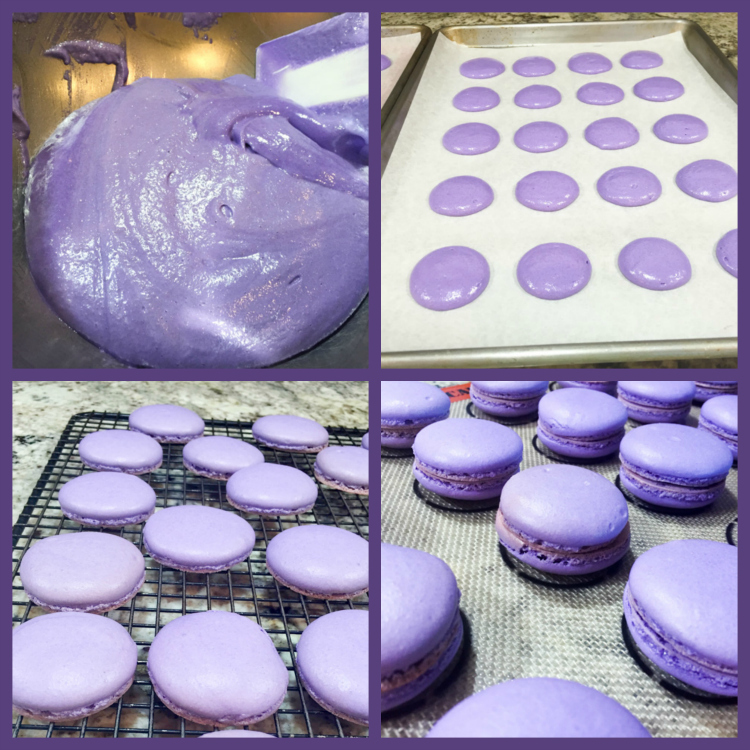 Rachael is very creative with her macarons, and came up with wonderful variations, including one that uses sesame seeds instead of almonds. She is inspiring me to spread my wings and try to fly a little higher. I still want to try again the Italian meringue method because I am stubborn. There, I admitted it. And yes, that was confession number two. But Phil doesn’t need to know. THREE YEARS AGO: Happy Valentine’s Day! First Monday Favorites is the blog event started by Sid. 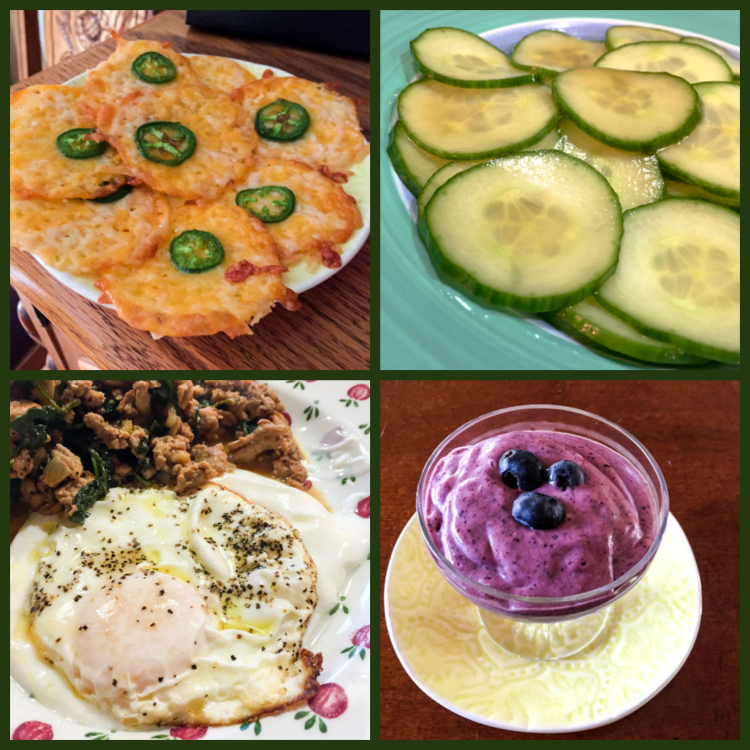 Participants share their favorite recipe from the previous month. Not necessarily the most popular by views or comments, but our own favorite. Click on the link below to see everyone else’s favorite recipe. And, if you’d like to participate, visit Sid’s website and drop her a line, we firmly believe that the more, the merrier! STAY TUNED FOR NEXT MONTH’S FAVORITE!